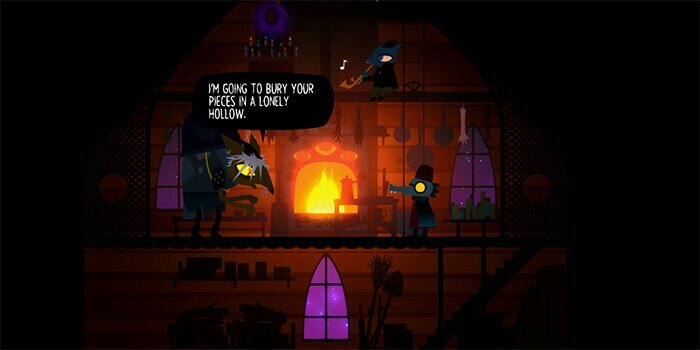 A few years ago, Infinite Fall ran a (very, very successful) Kickstarter campaign for a game called Night In The Woods. Like many Kickstarter games, it took much longer to come out than they first promised. In an attempt to allay some frustration, Infinite Fall put out a few short auxiliary games to let folks know that, yes, they were working on something and that, yes, it would be worth the wait. Since then, Night in the Woods has come out (and it's good! I think! I'm going to write more about it later! ), but it's one of those short auxiliary games--Lost Constellation--that stands up completely on its own. The game starts with a young girl named Mae (who looks like a cat) being told a story by her grandfather (who also looks like a cat) about a Longest Night (a winter holiday celebration) many years ago, featuring a young astronomer (who looks like a crocodile) and a promise that astronomer made (to someone, though we're not sure who at the start). The player controls that crocodile-astronomer — named Adina Astra — as she enters the woods with a singular goal and a willingness to face whatever trials or horrors lie in the woods on the longest night of the year. You're not alone in the woods. Adina's story is not one of solitude. She not only encounters other travelers in the woods, but folks who call these woods their home: a small priest-mouse, a cat-who-is-actually-a-cat, a coffin-maker who resents your repeated intrusions. And then there are the snowmen you build and accidentally imbue with the spirits of those who died on their own Longest Night quests. The paper-cut quality to the design is truly gorgeous. The stars twinkle in the sky. The colors are are dusk blues and purples, with warm dots of yellow like lit windows at night. The animation is smooth; I literally spent five or so minutes jumping around just to see Adina's cape flip about her. Lost Constellation is more of a story than anything else. There are small puzzles to solve and some low-stakes time trials, but everything feels like an experiment. And it's definitely not scary, despite the ghosts and corpses that live in the woods. All the spookiness is that of a folktale. Sure, there's a crone who threatens to kill you out of spite, but she also asks you why it is that powerful women are called witches. Like everything in the game, talking to the crone is a lesson to learn more than a task to complete. Or maybe that your grandmother would tell. Or grandfather. Or Mae's grandfather. Or Italo Calvino. Sure, Adina is full of anachronistic quips, but these don't feel shoehorned in. They feel like how stories get updated as they're passed down from generation to generation. Or, perhaps, they feel like a reminder that the stories that are passed down from generation to generation were full of quippy, flawed, angry, forgiving, walking meatsacks like you and me. Infinite Fall does a heck of a job creating a mythology full of ghosts, women in the woods, godtenders, and astronomers. 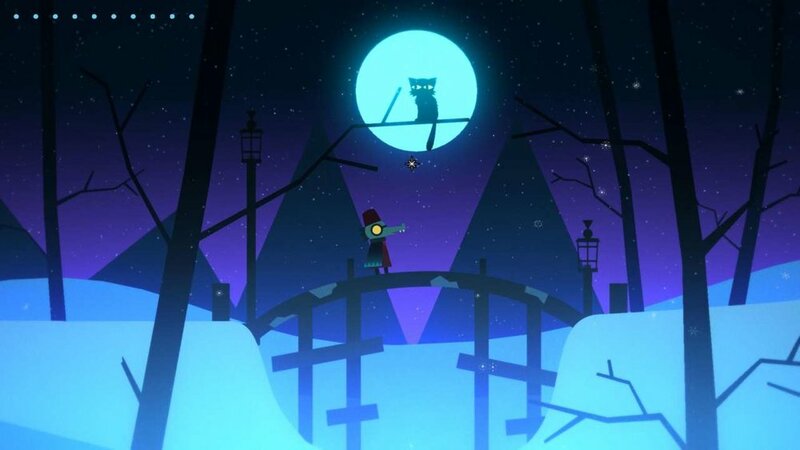 In the long-awaited-and-finally-released Night in the Woods, they continued that trend. However, in this game, partially due to its brevity (with a play-time of 3-4 hours), their writing feels tighter and the story is cleaner than the full-length final product. But, again, I'll go more into Night in the Woods properly, later. I wrapped myself in a blanket, turned off the lights in my room, and played right through. I'll probably do it again next winter solstice. It's a beautiful little present: a modern ancient story that asks you, "What's waiting for you in the woods, and what are you willing to do to get it?" You can get Lost Constellation on itch.io at a pay-what-you-can price.